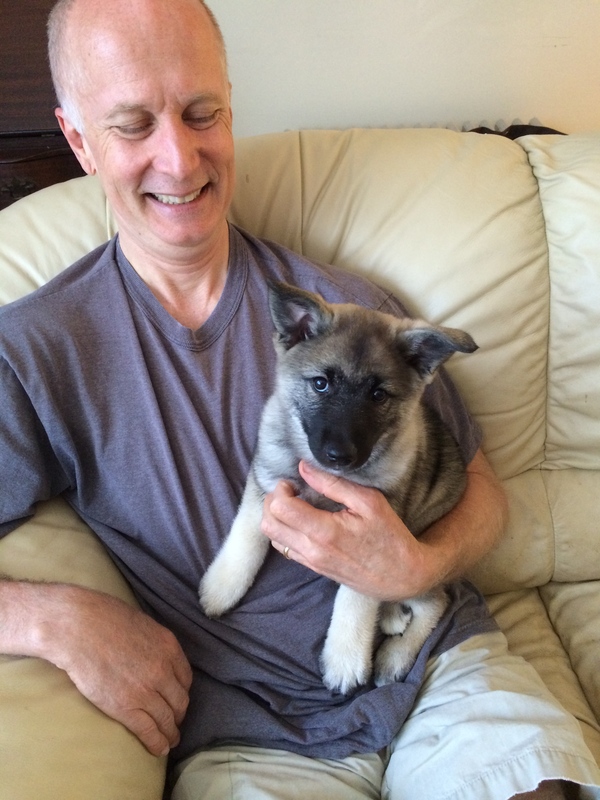 One of my favorite holiday traditions is celebrating with the newest member of the family, the puppy! 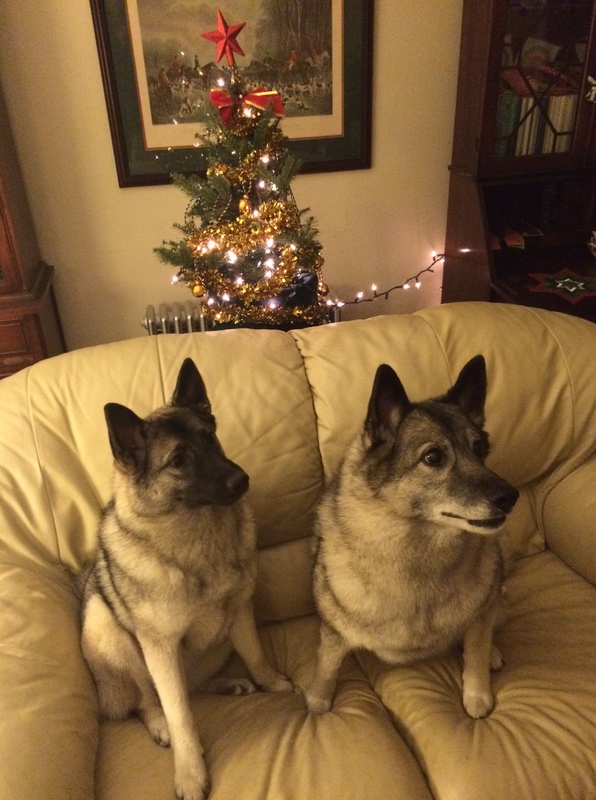 No matter when the puppy arrived during the year they will always have a first Christmas. Like most of us dog lovers, I’m guilty of overindulgence of my treasured pets. Besides the toys and treats, monogrammed stockings were ordered for them this year. Ok, that was more for me than them. Puppy’s first Christmas is full of wonder and investigation, so in the spirit of safety, no decoration reaches into the puppy zone. Believe me, it’s taken multiple puppies and years of broken ornaments, knocked down large trees, drinking Christmas tree water, licking pine needles, ripped open packages, eaten candles and close calls with poinsettias to come to this design. There are just too many holiday hazards with poisonous plants, glass ornaments, tinsel, chocolate, electrical wires, and open flames to even consider using them. 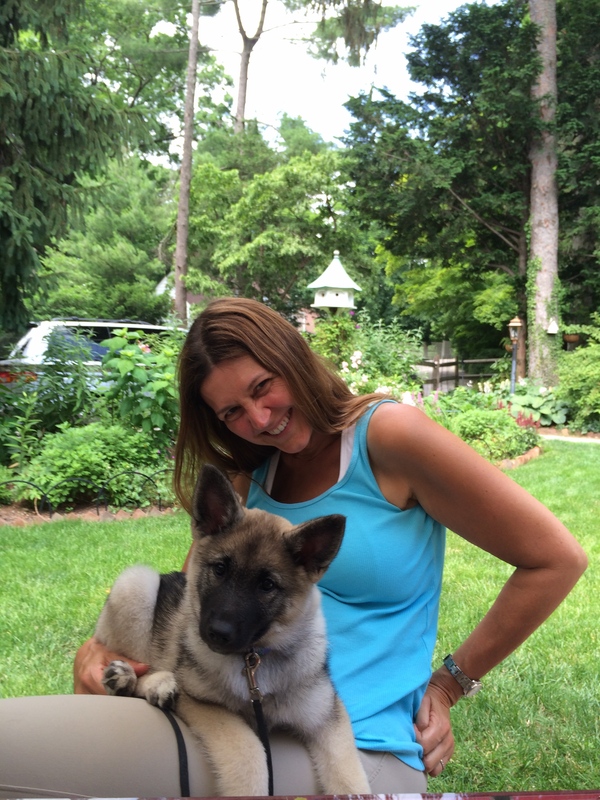 I prefer simplicity and peace of mind for my newest puppy and family pack of high energy hunting hounds. 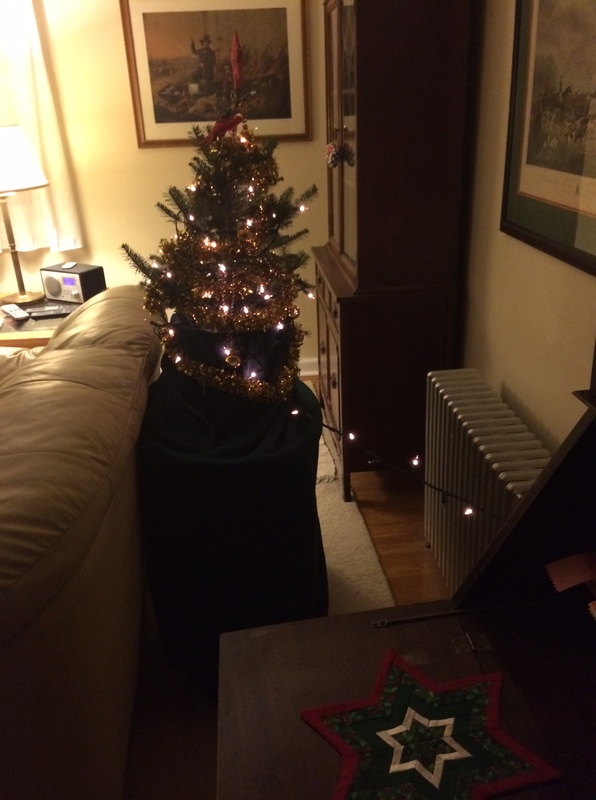 The centerpiece, a two-foot tall Douglas Fur tree in a bucket, rests atop a three-foot tall table placed behind the couch. This keeps it above puppy’s sightline and out of the indoor play area (i.e., the center of the living room). By wrapping a tree skirt (I’ve repurposed an old horse’s dark green quarter sheet) around the bucket and draping table, it keeps inquisitive puppy noses away. Tree decorations are kept to a minimum: one strand of gold garland, a handful of little ornaments and one string of lights. Lights are strung from the tree across the narrow passage way 3 feet above the floor behind the couch to behind a secretary to plug in. This way, no electrical cords are on the floor for a nosy puppy to check out. With no room under the tree for the gifts, again, we elevate them even higher, on top of the secretaries near the ceiling. A few larger ornaments previously hung on the big tree now dangle from hutch door fronts and wall sconces. My favorite are two lovely gold painted horseshoes adorned with jingle bells given by the NBLA as party favors at one of their holiday celebrations years ago. Every decoration and wrapped gift is placed 3 to 5 feet above the puppy zone. 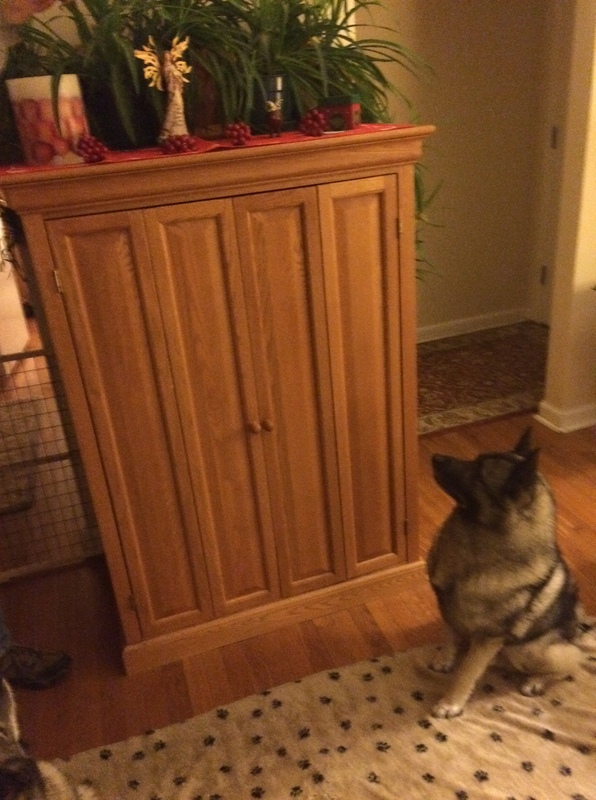 Keeping all decorations way above the elkhound’s sightline keeps all elkhounds safe for the holidays. I don’t know when I first heard this fable, but as a child I always believed that all animals bowed down on their front legs at midnight on Christmas Eve to pay homage to all the animals at the Bethlehem manger watching over the birth of Christ. In my childhood home we had a miniature manger complete with biblical action figures, glittering wise men, and an assortment of animals. While counting down the 12 days of Christmas I’d play out this fable with cows, camels and sheep all bowing down in front of the little cradle with the baby Jesus. One day I noticed baby Jesus’ leg bore teeth marks, no doubt from one of the family dogs, who thought he was a toy! The following year, the manager moved from under the tree to the table top. I was never awake at midnight, since I didn’t want to scare away Santa Claus, to see if my pets took part in this tradition. For the first time in decades, just my husband and hounds will be home, just the five of us, to open our gifts on Christmas Eve. Our puppy will be introduced to the giving of the gifts. The celebration begins with the unwrapping of numerous toys that all three dogs will vie for. After they rip off the wrapping paper, the fun begins. Anyone with a pack knows that what ever toy/bone/treat the other dog has is always better than what they have. The pack plays what I call musical bones! And it usually starts with the youngest puppy going after the alpha dog’s bone, if successful, the alpha goes after beta’s bone, who then turns around and goes after the puppy’s bone. Repeat. Repeat. Repeat. This bone-stealing ritual continues unrelenting until they are all exhausted from posturing, chewing and the sheer excitement of something new to play with. After about an hour, the puppy collapses on the floor into immediate slumber, the old dogs soon follow. Then us humans can open our gifts in relative peace. This year I’m hoping to extend the celebration to midnight to finally see for myself if the dogs bow down in honor of the animals in Bethlehem. Happy Holidays to all Hounds from Adele, Jinx & Linx.